Following 5 years of operation by Metrobus, the 54 (and 75) is now back at its traditional home of Selkent's Catford garage. The route was formerly allocated in the "prestigious" TL1+ running number sequence, and whilst this had been re-used for other routes in the meantime, a judicious schedule change a few weeks before takeover vacated the series once again! Possibly the largest operation of hybrid powered buses outside central London is now focused on the Lewisham area, and 12261 (SN14 TVW) passes through Catford on its way to Elmers End on 3 May 2014, the first day of the new contract. The route had originally been due to receive Volvo hybrids, but these have been switched to Plumstead for route 53 instead in a shuffle-around of batches. Instead the 54 and 75 have gained these Alexander Dennis E40Hs. Two further views are provided, both showing 12290 (SN14 TXJ) on the stand at Woolwich, next to the former Covered Market (now closed) – a particularly down-at-heel area of Woolwich – again on 3 May 2014. As a point of interest, the crane seen reflected in the bus window in the first shot is working on the construction of the Crossrail station in Woolwich. I am not sure if we have a bus enthusiast in the making in the second photograph! 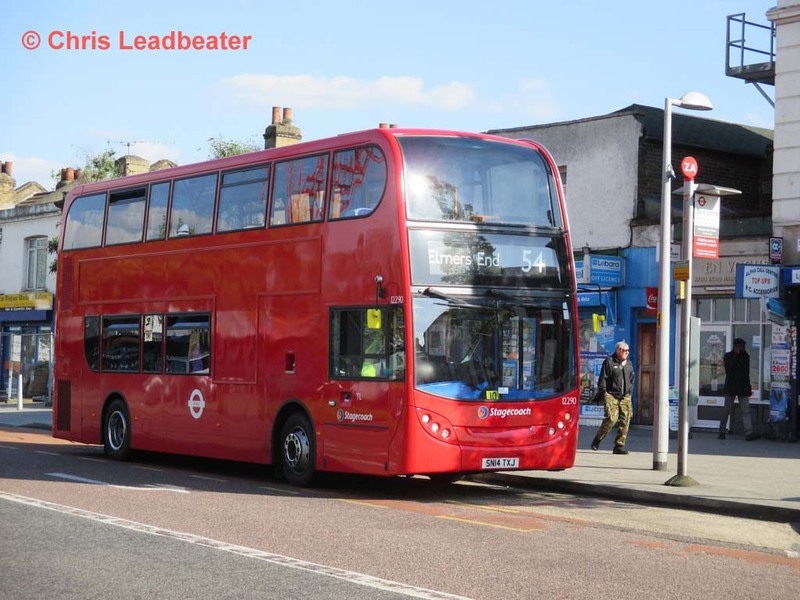 The award of the 54 and 75 to Metrobus in 2009 was quite a surprise, although the company does operate a number of routes in the Lewisham/Catford area, quite remote from its garages. 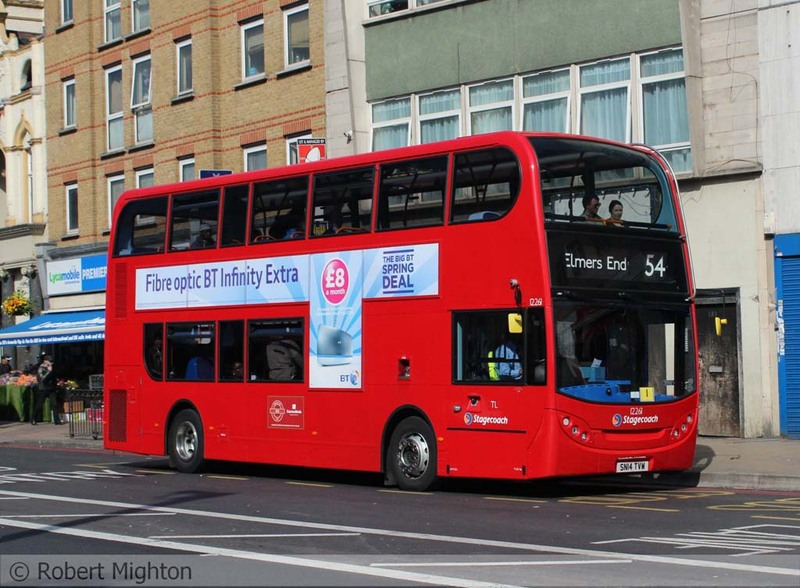 The 54 was initially operated from Orpington (Green Street Green) garage, but later moved to Croydon (Beddington). The transfer caused quite a storm as Selkent used TUPE regulations forcing Metrobus to take on the existing staff on Selkent terms and conditions – this has since become widespread, now that bus drivers’ wages are arguably higher than their market value meaning that staff turnover is low and shedding excess staff can be difficult. The 54 and 75 did not get 2 year extensions for good performance despite easily meeting their targets, and speculation is that Metrobus was making a loss throughout the contract as a result of the TUPE transfer. Whilst the 54 was traditionally a Catford route, other garages, notably Plumstead, have helped out from time to time, to suit needs on other routes. Plumstead ran the route from November 1988 until August 1989, helped again from April to November 1991 and gained the route outright from 24 July 1993 to make room for the hefty 208 at Catford. It remained there until January 1999, when it was moved back to Catford to make room for the 96, 99 and 178. However loss of route P3 (now 343) and gain of work at Catford (181/284) saw part of the allocation moved back to Plumstead from March 2001, but it reverted to Catford (along with the 202) in March 2003 to make room at Plumstead for new articulated bus route 453. The 54 is however perhaps best known for an unfortunate saga in the story of Croydon’s new Tramlink system. It was inevitable that when trams started running there would be some changes to local buses. Many of the changes were sensible and predictable, others were pointless but harmless. A couple however were quite unexpected and unpopular. Easily the most controversial was the proposal for route 54, which for as long as anyone can remember had been the trunk route linking Woolwich, Lewisham, Beckenham and Croydon. In 1934 the actual route was Plumstead Common to Selsdon, but apart from losing those end sections and a few brief extensions at the Woolwich end, the route had survived completely unchanged until 2000 (apart from the Catford one way system, which has since been removed as far as buses are concerned). Now, the Tramlink network includes a branch that heads off from Croydon in vaguely the same direction that the 54 did, towards Elmers End and Beckenham. 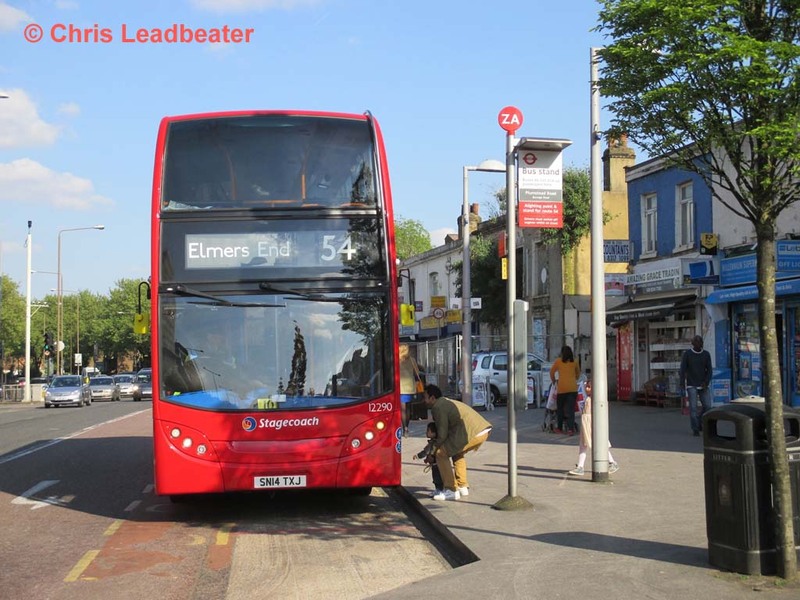 In order to remove any possibility of buses undermining Tramlink’s success, the 54 was withdrawn between Elmers End and central Croydon. Such cutbacks are not unusual, and admittedly the 54 was quite a long route by modern standards, but were it a purely bus change there would doubtless have been a substantial overlap between the 54 and its replacement at the Croydon end. However Tramlink terminates at Elmers End, so there is no such overlap. As a result, where passengers from places such as Bellingham enjoyed a direct service into Croydon, they were now deposited in the middle of nowhere, expected to walk some distance to catch a tram, and pay again for the privilege! Moreover, Tramlink follows a substantially different route between Elmers End and Croydon, running via Addiscombe instead of Shirley Park. Bus route 289, the only other route along Long Lane between Elmers End and Ashburton Park, continues via Addiscombe into central Croydon. It would have made more sense to withdraw this, as very little would have been lost. At least the original proposal to terminate buses at Elmers End Green was not proceeded with. This would have led to a 10 minute walk to the tram stop. Instead it was decided to build a small interchange in a triangle of waste land beside the Elmers End Tramlink terminus (which is within the railway station). However, as the launch of Tramlink loomed there was no evidence of any work taking place. So when the day (20 May 2000) came, buses dumped their passengers on the road past the station (still several minutes from the tram platform), before going on quite a lengthy adventure round the back streets of Anerley in order to turn themselves round for the return journey! This took up to ten minutes, by which time buses would have been half way to Croydon anyway. But the damage was done. People do not like changing, especially if it means a change of mode with the substantial time and price penalties that incurs. A journey from Bellingham to Croydon previously took about 30 minutes and cost 70p, after the change taking about 40 minutes and costing £1.60. Passengers from Lewisham and Catford transferred to route 75, but that takes several minutes longer and, at the time, only ventured as far as West Croydon, not ideal for shoppers. Those from Woolwich and Blackheath seem to have vanished without trace while most of those from the Beckenham Hill area have generally opted to walk to Beckenham Junction stop instead. Apart from the considerable inconvenience to passengers, all sorts of things were wrong with the new arrangements. Tramlink was not very frequent, with just a half hourly evening and Sunday service, so it was important to co-ordinate the timetables to ensure the minimum of delay. Despite this being done in the first instance, it was not unusual for buses (or trams) to arrive late resulting in a missed connection and a 30 minute wait. Frequent timetable changes in the early months of Tramlink were not speedily matched by changes to the bus timetable, and indeed on one occasion the 54 timetable was altered to match the latest Tramlink times only two weeks before the next Tramlink change! Moreover it was impossible to achieve the evening timetable co-ordination in a cost effective way, leading to 30 minutes stand time having to be allowed at each end of the 54. Thus the same number of buses was required as for running into Croydon! On Sundays buses on the 54 had run every 20 minutes, so to co-ordinate it was a choice between running buses every 30 minutes or every 15. Clearly the former would not be acceptable so the frequency had to be increased, again meaning no savings in vehicle and staffing requirements. And with the lengthy terminal working at Elmers End only two buses were saved even during the day on Mondays to Saturdays. And that was another problem. Needless to say the residents of the formerly quiet side roads around Anerley cross-roads were not too pleased to have double deck buses thundering past every 12 minutes. Also, there was no proper stand on the road outside Elmers End station, leading to buses blocking the carriageway on this busy road. Since nobody seemed to be changing to the trams at Elmers End, it was decided to abandon this silly terminal working loop and instead terminate buses outside Tesco’s nearby. That way buses could run back via the Tesco’s roundabout in order to stand on Elmers End Green – still not very efficient operationally, but in most respects an improvement. Passengers wanting to travel to Croydon were advised to change at Beckenham Junction instead, although this is not ideal either, involving crossing a busy junction, which takes several minutes. And the final chapter to this saga is – that the long-promised Elmers End Interchange finally opened to the public on 5 February 2011 ...! Not that anybody much seems to be using it.